Trump to supporters: "The Russian hoax is finally dead"
President Trump used Attorney General William Barr’s 4-page summary of the Mueller report to take a victory lap and rile supporters at a boisterous Michigan rally Thursday night, declaring: "After three years of lies and smears and slander, the Russia hoax is dead." 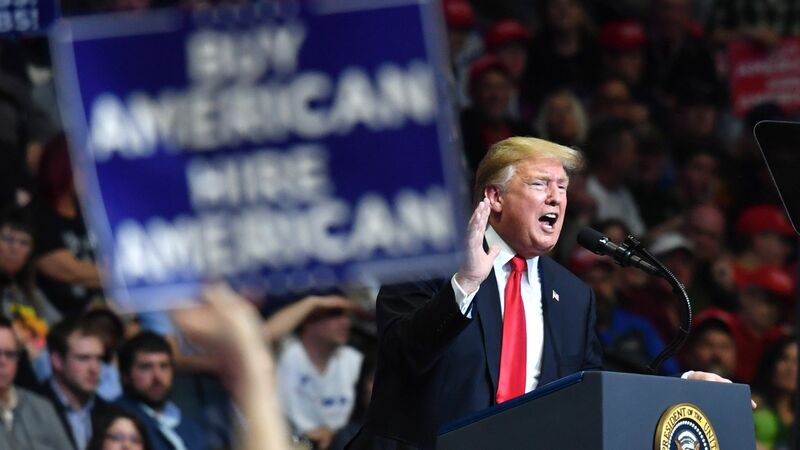 Details: This is the president's first rally since the end of Special Counsel Robert Mueller's 22-month Russia investigation, which did not establish any conspiracy between the Trump campaign and Russian officials to influence the 2016 election, according to Barr. Trump used his campaign-style speech to tear into Democrats, including the House Intelligence Committee Chairman, whom he called "little pencil-necked Adam Schiff." "The collusion delusion is over. ... This is nothing more than a sinister effort to undermine our historic election victory and to sabotage the will of the American people." Trump doubled down by calling the probe a "witch hunt," adding that Democrats "are on artificial respirators right now. They are getting mouth-to-mouth resuscitation." He took jabs once again at the late-Republican Sen. John McCain over his historic vote against Trump's attempt in 2017 to repeal the Affordable Care Act. He lashed out at the "fake news media," which he claimed have propagated the "hoax" of his collusion with Russia.